Donald A. Alati, 79, passed peacefully on January 23, 2019. Donald was born in Cascade (Gorham), New Hampshire, to Columbia and Antonio Donald Alati on August 23, 1939. He attended schools in the Gorham area. One of Donald’s early, vivid memories, which he recounted often, were the events following November 30, 1954. NE airlines flight 792, a Douglas DC 3, encountered snow squalls, reducing visibility to zero during a flight to Berlin, New Hampshire. The plane crashed into the southern slope of Mount Success (3,565 ft) in the Mahoosuc Range of New Hampshire’s White Mountains, sadly with fatalities. A gentleman from New York, Lloyd Webb Sr., bought the salvage rights (operations) for the plane. He hired Donald, who was a teenager, to help with the wreckage. Don brought Lloyd Sr. to his home for one of his mother’s Italian home cooked meals, and then Lloyd became family when Don’s sister Pauline eloped with Lloyd Sr! This is one of Don’s most memorable life experiences. Don’s life career took him through many different adventures, one of which was driving Allied Van Lines cross country with Lloyd Sr. His stories were many, as he worked in various character-building construction jobs. He worked with Gene Calley, Tom Mango, and the late Albie Sanborn. All remained close friends over the years. Don retired from Tilton School in 2005 as Maintenance Supervisor after 21 years of dedicated work. A man of many interests, Don loved riding his Honda Goldwing with Jean through the country roads of New Hampshire, and he especially enjoyed riding in the White Mountains. He loved anything that got him outdoors, especially futzing in his man cave/garage, tending to outdoor wildlife, and attending the Wednesday-night car shows at the Tilton Diner. 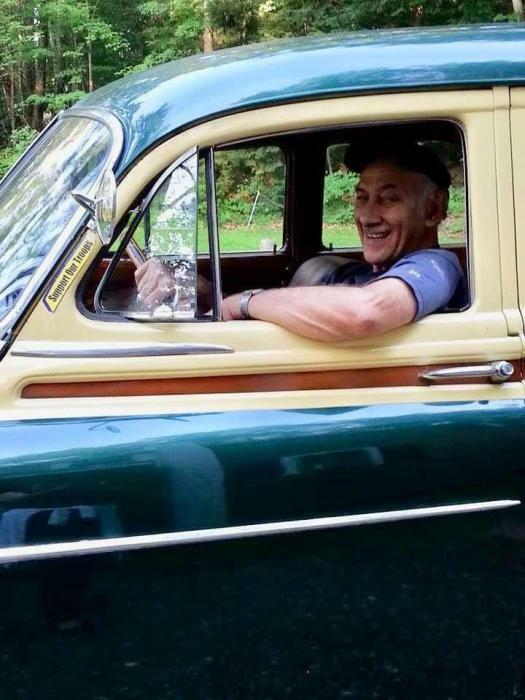 He cherished his 1950 Chevy Woody Wagon, and enjoyed talking with friends and strangers about it. Every Friday, Don looked forward to guys’ day out with his longtime friend and former co-worker Ervin Hodgman where they would frequent Lowes, Home Depot and get some lunch at the Shang Hai Chinese restaurant in Laconia. At 3:00 P.M, the always-interesting, never dull, coffee hour would begin at home with close friends coming over for laughs and spirited conversation. Don was a good friend to many. Per Don’s wishes, there will be no visitation, and there will be no services. There will be a springtime celebration for sharing stories, reflections and fun memories of Don’ life. Don was predeceased by his mother and father and sisters, Mary, Pauline and Lorraine, and his brother-in-law, Lloyd Sr. He leaves his fiance and partner, Jean P. Bergeron, and her family; sons Scott and Ryan; grandson Tyler and Shauncie; his devoted nephew, Lloyd Webb Jr. and wife Kelly; brother-in-law Ray Halle and Lee; nieces Sharon, Andrea, Vicki; nephews Matt, Mark, Chris and Mike; longtime close friends, Ervin and Brenda, Steve, Frenchie and Nancy, Freddie and Joyce; and all of his Paulis restaurant friends, especially Cheryl and Linda; and many more people with whom Don bonded over the years and shared memorable experiences. Donations in Donald Alati’s memory can be made to The Tilton Fund; %Tilton School,30 School Street, Tilton, NH, 03276. Thibault-Neun Funeral Home and Cremation Service are assisting Mr. Alati’s family.